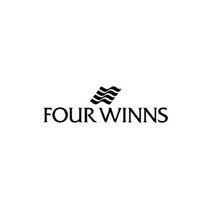 Four Winns was established as a family business company back in 1975. Paying attention to the demands of their clients, they have prosperously blossomed into one of the major league players in the marine market with regards to fiberglass recreational crafts. Their boats leave a mighty imprint wherever they travel and they have been recognized around the globe. The personnel from the Four Winns shipyard are dedicated, hard-working and never settle for next-to-best vessels. Their goals and objectives are based on perpetual development resulting in sublime crafts. Four Winns encompasses different boat series like Horizon, Signature, TS, Sundowner, Vista, RS, and HD series. The Horizon series is graceful open-bow sport platform boats that span from 18 to 44 feet. They are distinguished by their new elegant colors and diversified amenities with the newest technology in the market. The largest mega bowrider in the market is the Four Winns H440 which belongs to the Horizon series. Even though this vessel seems like she has been supersized, she hasn’t lost the elegant and grand touch. To put it to you, she is a synthesis of express boat styling on one hand, and on the other hand, she is a fun and eccentric bowrider. Let’s check out the Four Winns H440 review. The length of the Four Winns H440 is 43 feet and 6 inches with a beam of 13 feet and 4 inches. The styling of the boat is marvelous with the stylish inflection point and low-profile demeanor melted with bountiful stainless steel elements complementing the ingenious appearance of the boat. The patented stable V-hull is made out of a premium gel coat, vinyl ester barrier coat, vinyl-ester skin coat and knitted bi-axle fiberglass. This V-hull gives a smooth ride in different weather conditions. The hull is designed in a way that it can be armed with either 1 x 370 horsepower Volvo Penta IPS500 with a joystick that produces 370 horsepower at 3500 rpm or 1 x 435 horsepower Volvo Penta IPS 600 with a joystick. Either way, the owner will not make a mistake when having to choose. The IPS system cuts down the fuel consumption too. The engineering brilliance is also depicted via the H440's swim platform. The swim platform's hydraulics can lower the platform under the water enabling the owner to bring his personal water craft on board. The swim platform is extremely versatile since there is a barbecue with a stainless steel cover in front of it. Spending a day on the swim platform and cooking on the barbecue with friends and family is something extraordinary. Right next to the barbecue, to port, there is a storage place with table utilities. Consequently, one can mount the wooden table next to the barbecue and fulfill the day with all its features. Even if the swim platform is lowered underneath the water, a step is provided so people can go to the barbecue without the need for the swim platform. The sunpad is electrically activated with the press of a button. Thus, the back of the boat can be transformed into a sunpad for resting and entertainment. Entering the cockpit can be done via steps both to port and starboard with the assistance of stainless steel handles and extra long bar rails. The cockpit of the H440 is impressive. The hardtop that can be retracted and the windows surrounding the cockpit allow the skipper to have a vast view ahead. Two individual seats are in front of the helm with thick upholstery and flip-up bolsters. The helm is designed like an aircraft: totally computerized, with two flat panel displays, Chartplotter, the entertainment system, the radar, digital steering, GPS, autopilot and the Volvo-Penta joystick steering. The island lounge in the cockpit speaks for itself. 6-8 guests can be accommodated around the table. The entertainment center is supplemented with a sink, fridge, ice-maker, and a TV. The air-conditioning can quickly cool down the whole cockpit which is a valuable asset during the hot days out on the water. The fiberglass top can be electrically moved, allowing people to cross the cockpit and enter the bow area of the H440. It is one of the most innovative areas in the bowrider itself. This entertainment center is quite low giving the passengers the feel of comfort and safety. Stainless steel holders additionally boost the safety sensation. The sound system can be controlled in the bow via any device that has Bluetooth or Wi-Fi connections. Further, the sound system includes four speakers and one subwoofer marking this spot as a remarkable entertainment center. The table can be raised with the press of a button. It can reach the mid-height position and when covering it with a cushion, it is converted into a sunpad area. Additionally, if heightened more, it serves as a table that can seat up to 8 people for enjoying a beautiful meal during any part of a day. A cooler is also integrated into the bow so people don’t have to leave the bow for the refreshments. We have to highlight the fact that there is no noise and vibrations in the bow whatsoever. Moreover, the designers have come up with a beautiful piece of fabrics covering the bow like a sailboat and protecting people in the bow from the sun. Moving to the most forward part of the bow, one realizes that the bowrider is also designed as a yacht for that matter. Stainless steel bow rails, large cleats, useful and modern open front, stainless steel anchors, spotlights and under the fiberglass door, windlass and wash down are concealed. Therefore, the H440 is the combination of two important parts of the industry, a bowrider segment and a cruiser segment at the same time. Stepping below the H440 bowrider, one can choose the interior styling between a light maple and a dark cherry. One immediately notices the lavishing micro-galley to starboard. The galley is furnished with a cold/hot water sink, a small work surface, a refrigerator underneath and a microwave in the cabinet above. The saloon is to port and it houses a convertible sofa that can accommodate two people overnight. The tables, storage, and TV make it a perfect breakfast center for instance. The back of the boat's below deck is quite cozy with full headroom everywhere. This is the master stateroom with the king-sized spring mattress that occupies the main part of the area. A large 40 inch TV is just ahead and lots of lights decorate the room. The natural light comes from the windows from the side and the skylight from above. The largest bowrider in the market deserves the largest head. Opening a wonderful door made of glass and wood, one enters the head which is located to starboard. It is quite immense with upscale details and design. The shower is tremendously big and can be closed with a transparent door. The enormous hull side window bathes the area with natural light. The vanity cabinet with a sink that includes European faucet and a porcelain toilet furnish the head. Additionally, the head is supported with a 53-gallon holding tank and 45-gallon gray water tank. Another private cabin is situated up front. It is very big and offers two sized bunks for kids or extra guests. The brand new Four Winns H440 is the largest bowrider in the market. Nothing has been built with this concept before. A bowrider with an enormous cabin and a hardtop is an exclusive option to have today. 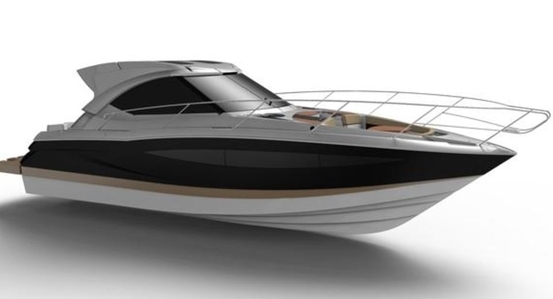 The concept itself is simply stunning and perfectly adaptable to the next generation of boaters. She was even awarded the National Marine Manufacturers’ Association Innovation Award at the Miami International Boat Show. The H440's layout is a combination of both bowriders and yachts, giving you the best of both worlds. What are you waiting for? Contact us now and get your own taste of this dreamboat and start living your life like you deserve with the incredible Four Winns H440. Inquire now!